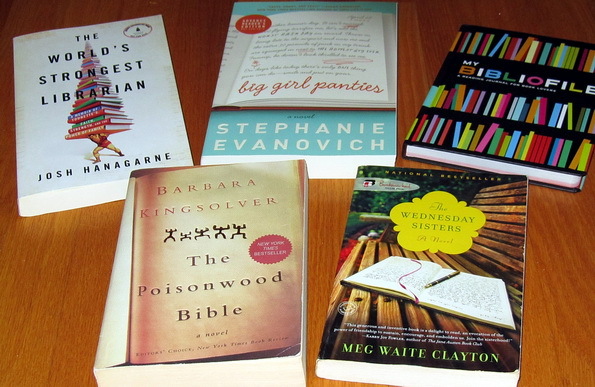 Hundreds of book bloggers are participating in this event, all starting at the same time. Here in Chicago that was 7am. This morning I am out bird watching for a few hours but will be listening to audio in the car. Later I’ll be sitting down with some print books or perhaps more audio as I multitask around the house and garden. I will be adding to this post throughout the day with updates and challenges. Bellman & Black by Diane Setterfield. I have a healthy snack today – apples from my tree, and some unhealthy chocolate bars for energy. Energy, yes, that’s my story and I’m sticking to it! I also have some microwave popcorn for the evening munchies. I love birds! See: Weekend Birding. If you’ve been here before, you already know this. As silly as this sounds, Read More! I get easily distracted by all the challenges and visiting other blogs. Using the titles on book spines, make a short poem. Pull some books from your own shelves that have books on the cover, take a picture, post it. Share your favorite book trailer with us. This beautiful and haunting production made me put Cascade by Maryanne O’Hara on my reading list. Yup, eyes are bothering me. Probably more from allergies than from reading. Spending four hours out in nature this morning looking for birds when trees and plants are producing pollen will do that to you! I finished the last 4 hours of the audiobook The Never List, which I had already started and I read a hundred more pages of The Circle of Thirteen. Only 50 more pages to go and then I start a new book. Probably will be Why Do Bluebirds Hate Me? – I’m in a bird mood. Chocolate! But I reserve the right to change that to popcorn later this evening. Not yet. I’m having enough trouble getting around to visiting all the ones I already know and love. Leslie, enjoy your reading! Apples and chocolate and popcorn, yum! 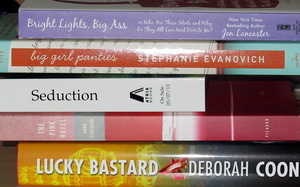 Your spine poem is funny. Have a great time, Leslie. Hope the bird watching was fun – did you see some special birds? Happy Reading Leslie — apples and chocolate — yummy. Just finished Bellman & Black myself — good but I like 13th Tale better.